Freshness and safety go hand in hand. If not kept at the right temperature, foods and beverages can spoil, causing potentially dangerous bacteria to form. Foogo® products keep foods and beverages safer and healthier longer. Long considered a trusted partner by parents in providing healthy food and drink options for kids, Thermos has brought its superior insulation technology to a new line of children's products for ages six months and older. 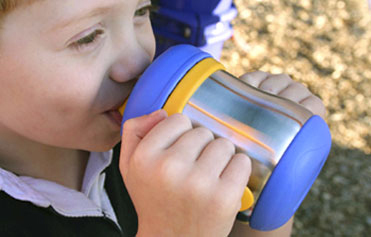 In July 2006, a study called "Comparative Study of Foogo® by Thermos® Insulated Vacuumware and Competitive Insulated Products on the Spoilage and Safety of Children's Food and Beverages" was conducted by Randy W. Worobo, Ph.D. Food Microbiology, Associate Professor, Department of Food Science & Technology at Cornell University. The primary focus of the study was to compare two Foogo® by Thermos products to three competitor brand "sippy" cups for insulating efficiency (internal product temperature) and the difference in growth rates of potential foodborne pathogens. One of the most important steps parents can take to avoid foodborne illnesses is to control the temperature of high-risk foods and beverages. When food and beverages are not kept at the right temperatures, foodborne disease-causing bacteria rapidly grow and multiply. In the test, temperature monitoring of the various sippy cups was conducted with apple juice initially at 40°F, which is the ideal consumer refrigerator temperature. All competitor products reached room temperature (70°F) in less than four hours, while the Foogo® by Thermos products reached room temperature in 16 hours. Bacteria can grow almost 4 times faster at 70°F compared to 40°F and can quickly increase to levels that are capable of causing foodborne illness when the food is consumed by infants. Due to cross contamination during handling or from improperly cooked foods, foodborne pathogens have the potential to contaminate the liquid and solid foods that are contained in cups and thermal containers. In the test, refrigerated milk was placed in all of the sippy cups and disease causing bacteria (Listeria monocytogenes) were added to each sample of milk at a dosage of 250 bacteria per teaspoon of milk. After spending 20 hours at room temperature, the milk sample in Foogo® by Thermos had only 1,000 bacteria per teaspoon, while samples in competitor brands had as much as 2.5 to 5 million bacteria per teaspoon. In other words, the milk samples in the competitor brands contained up to 5,000 times more bacteria than the milk in the Foogo® by Thermos. Each year throughout the U.S., foodborne illnesses strike more than 800,000 children. Considering that children have less-mature immune systems, i'’s easy to understand why babies and toddlers are especially susceptible. More than 200 known illnesses are transmitted through food. Food-related illnesses result in 325,000 hospitalizations and 5,000 deaths each year. Tainted food can’t be detected by the human nose, eye, or tongue, but only through lab testing. Under optimal conditions, bacteria can double in as short as 10 minutes. This means the number of disease causing bacteria can increase from one to 10 million organisms in less than eight hours. Bacteria is easily transferred from surface to surface, including skin. Wash your hands regularly: Proper hand washing is the most important step parents can take to prevent food-borne illnesses. Handle milk and other foods with care: Milk is rich in nutrients that allow bacteria to thrive. At room temperature, the number of bacteria in milk can double within 10 to 20 minutes. When in doubt, throw it out: Don’t count on your eyes, nose or tongue to determine if food is safe for your infant or toddler. Foods and beverages contaminated with millions of potentially pathogenic bacteria can look, smell and taste perfectly normal. High-risk foods and beverages should be kept heated to temperatures above 140 degrees or they should be kept cold with vacuum insulated products like Foogo® by Thermos®, which can keep beverages below room temperature for 16 hours (starting at 40°F) – four-and-a-half times longer than competitor brands. Make the connection, break the chain: Food-borne illnesses are serious and cause potentially life-threatening conditions. They most frequently occur when bacteria on the hands of others are transferred to the foods and beverages that are consumed. Simple hand washing can break the chain.